Group of handball players in 1914 with Micky Mordue seated right and Micky's brother Jacky seated left, standing behind are the Stones brothers against whom the Mordue brothers played 'four hands against six hands'. Sketch by F. Turnbull showing the monumental structure in 'Handball Alley' near the Big Club, Horden, against which the game of handball was played. "Micky Mordue was on deputy work at Horden Colliery when war broke out. He joined up in August 1914 and went down in Dardanelles in 1915. The other one, Jacky Mordue played football for Sunderland. The Mordues were world famous for their handball playing. The two Mordues played against the three Stones brothers, that was four hands against six hands and that was the only way people would play them. It was a game where a lot of brute strength was required. They would use brute strength with cuteness. They trained before the big match for weeks, hitting the ball against the alley, from one corner to another. I have seen a match go on for six hours. They played it on every street corner and gable-end. If they thought they were good enough they would try for a game on the big alley for money. The players would travel right around. Trapper Charlton, Pauly Tennant, Jacky Cook, Trapper Harkness - all from Horden with the Mordues, and all good players". Group outside the 'Big Club', Horden with Micky Mordue standing second from right, standing fourth from right is Tommy Coatman. In front, first left is Bobby Dunne and third from left is Bill Coatman. Horden AFC 1912-13 (part only) with Micky Mordue in centre row, fourth from left. Horden were Wearside league winners in 1912 and 1913; they won the Monkwearmouth Charity Cup in 1912 and the Seaham Charity Cup in 1913. 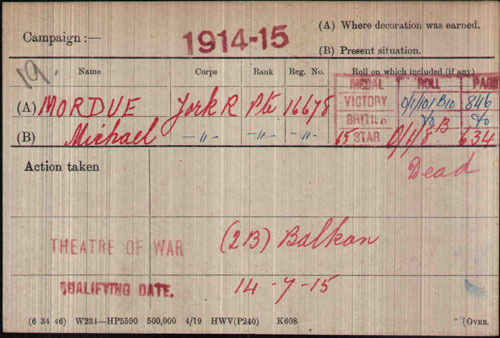 Private Michael Mordue enlisted in 1914 and joined the 6th battalion Yorkshire Regiment. He joined the Gallipoli campaign and took part in the Suvla Bay landing and was killed in action on 22nd August 1915. Michael Mordue is commemorated on the Helles Memorial for those who have no known grave. Cape Helles is situated on the extreme south-western point of the Gallipoli peninsula. Mrs Mordue, 17 Eden Street, Horden, Durham county, has been informed that Private M. Mordue, of the 6th Yorks, was posted as missing after an engagement on August 22nd. Medal Card for Michael Mordue and below, examples of the medals awarded.